Venice 1000mm White Designer Furniture Pack - Only £429.99! Full furniture set including Basin Unit, WC Unit, Countertop & Basin. In stock now for just £429.99 including VAT! Hurry while stocks last! Add some luxury to your ensuite, downstairs cloakroom or bathroom with the stunning Venice White Designer Furniture Pack. 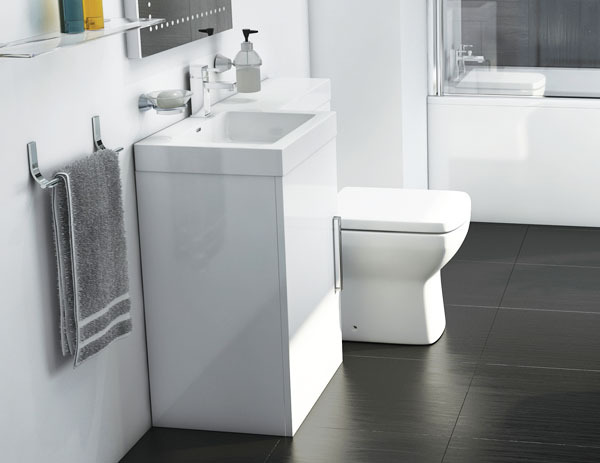 Having a toilet, basin and storage in a compact bathroom suite layout makes this ideal for any additional or secondary bathroom. The modular contemporary bathrooms suite design is offset by a highly modern, eye-catching and memorable gloss white finish. 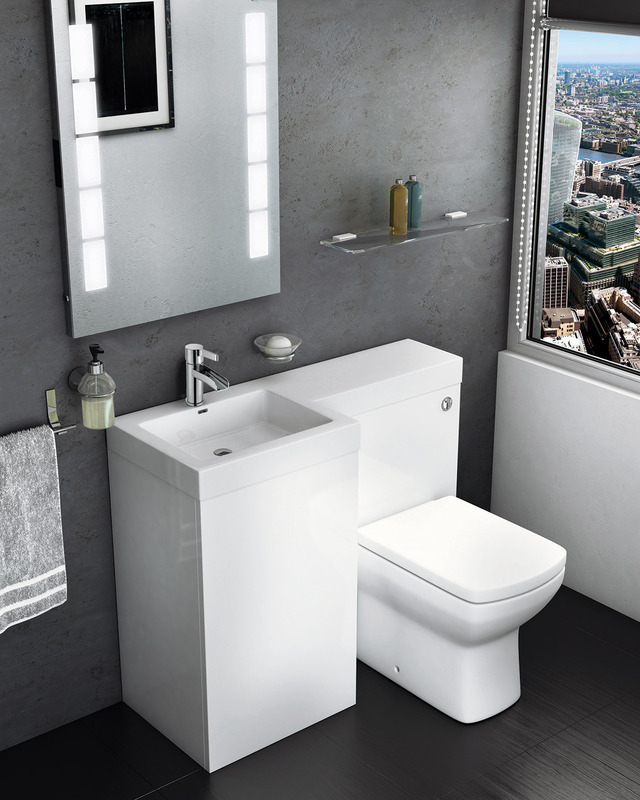 The Venice Furniture Pack features a stylish and unique L shape integrated basin and can be combined with a back-to-wall WC unit of your choice. This superb contemporary gloss white furniture set is built to the very latest in bathroom designs, and encompasses the latest in bathroom trends. 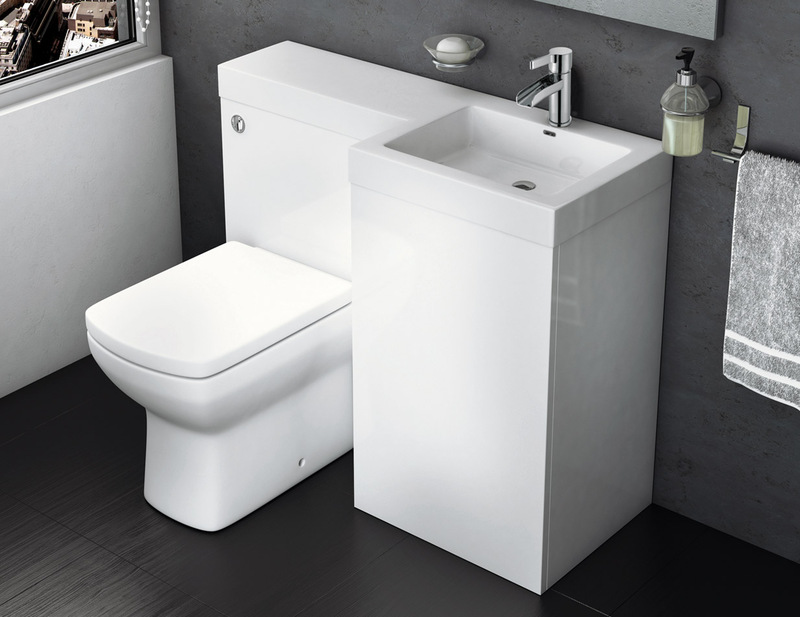 This unit, which comes complete with a unique L shaped ceramic basin, will make your bathroom stand out thanks to its memorable shape and smooth, flawless white gloss finish. With bold, angular lines and a clean stylish look this fantastic bathroom furniture set is bound to turn heads. It is perfect for the modern home. It is equally at home within a cloakroom, an ensuite or part of a larger bathroom suite. It is fantastic value and cannot be beaten on price. This Venice 1000mm gloss white set is a modern take on bathroom furniture and is the perfect way of making a real statement as part your new bathroom. As shown in the pictures above, this superb quality furniture set includes an integral L shaped basin. The Venice Back To Wall (BTW) toilet shown however is not included as standard, but can be purchased as an optional extra, which can be added to your order via the menu at the bottom of this page. This pack does not include a concealed cistern, WC, or the tap pictured - these can easily be added to your order via the drop-down menu below. Include Back To Wall Toilet?